As a child my dinners consisted of meat, potatoes, and either corn or beans. Potatoes were on the table for almost every dinner (besides tacos). As a child I hated scrubbing potatoes and I disliked eating baked potatoes every other night. Now as an adult I see the benefits of including potatoes in our meals, they are cheap and filling. The potatoes in my pantry right now I haven’t had to pay a penny for. My parents have harvested 800 + pounds of potatoes and have been kind enough to share. 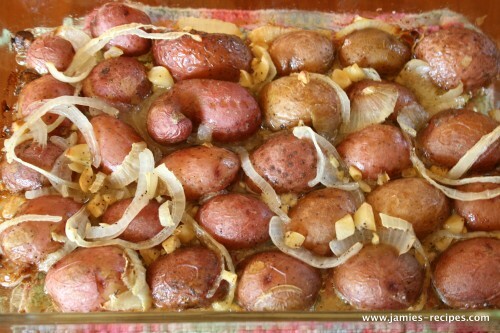 When we weren’t eating the traditional baked potatoes we would sometimes enjoy this potato dish. If you are patient enough the potatoes get golden brown and have a crispy butter crunchy side. They are wonderful. Unfortunately I didn’t adequately plan ahead and my daughters were “starving” so I pulled them out of the oven early. They were still delicious. This side dish is part of my pantry challenge where I am trying to use up what I have on hand before buying anything else. Pour melted butter in bottom of oven safe 9x13 pan. Place potatoes cut side down. Place sliced onions and chopped garlic on top of the potatoes. Bake for 1 hr or until potatoes are cook through. 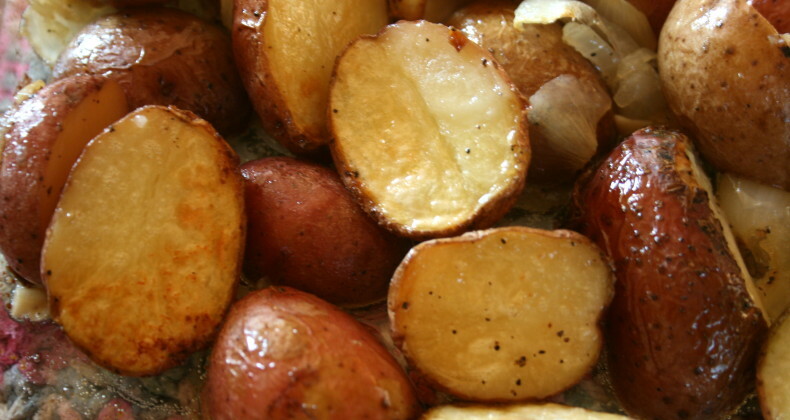 My Dad use to make home fried potatoes with onions, they were the best. He diced the potato into small pieces, about an inch long, half inch wide, quarter inch thick. He’d start the potatoes in a skillet, then add the onions, fry them up together in a skillet with some salt and pepper. So great! We made this with Chicken Cordon Bleu the other night! They went perfectly! Love this simple, quick, throw together recipe! Thanks Jamie! I dont make many potatoes anymore. But with only having boys in the house now they ask for them often. Will serve them these soon! Oh those potatoes look incredible!